Useful capacity of fuel tank: approx. The engine 0,9 TCe has a fuel tank capacity of 40 litres or 45 litres (depending on the vehicle). To open cover A, place your finger into recess B. When filling, use the cap holder 1 on the cover A to secure the cap 2. After filling, check that the cap and cover are closed. Use a high-grade fuel that complies with the legislation in force in each country and which must comply with the specifications given on the label on the cover A. Please refer to the information on “Engine specifications” in Section 6. Only use diesel fuel which complies with the information on the label located inside the cover A. 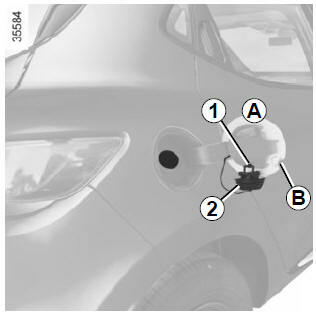 Fuel filler cap: this is specific. If you have to replace it, make sure it is identical to the original cap. Contact an approved Dealer. Never place the cap near a source of heat or flame. Do not wash the filler area with a high-pressure washer. The octane rating (RON) must comply with the information given on the label on the cover A. Refer to Section 6 for information on “Engine specifications”. Do not mix even small amounts of petrol (unleaded or E85) with diesel. Do not use ethanol-based fuel if your vehicle is not compatible with this fuel. Do not add additive to the fuel – otherwise you risk damaging the engine. With the ignition off, insert the nozzle and insert it fully before turning it on to fill the fuel tank (risk of splashing). Keep the nozzle in this position throughout the entire filling operation. When the pump cuts out automatically at the end of the filling procedure, a maximum of two further filling attempts may be made, as there must be sufficient space in the fuel tank to allow for expansion. Make sure that no water enters the fuel tank during filling. The cover A and its surround must remain clean. Using leaded petrol will damage the antipollution system and may lead to a loss of warranty. To ensure that the fuel tank is not filled with leaded petrol, the fuel tank filler neck contains a restrictor fitted with a foolproof system which only allows the nozzle for unleaded petrol to be used (at the pump). 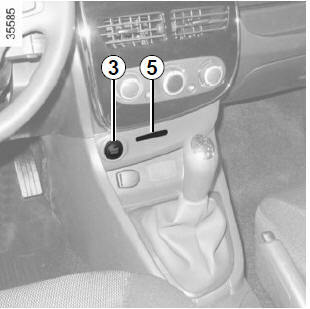 Vehicle fitted with the Stop and Start function To fill up with fuel, the engine must be stopped (and not on standby): stop the engine by pressing the engine stop button 3 (please refer to the information on “Starting and Stopping the engine” in Section 2). After a breakdown caused by completely running out of fuel, the system must be reprimed before the engine is restarted: Fill the tank with at least 8 litres of diesel fuel. Press priming bulb 4 several times. If the engine does not start after several attempts, contact an approved Dealer. Insert the RENAULT card into the 5 card reader. Press the start button 3 without pressing any of the pedals. Wait a few minutes before starting. This will enable the fuel circuit to be primed. If the engine does not start, repeat the procedure. No modifications whatsoever are permitted on any part of the fuel supply system (electronic units, wiring, fuel circuit, injectors, protective covers, etc.) as this may be dangerous (unless undertaken by qualified Network personnel). The engine may be hot when working in close proximity. 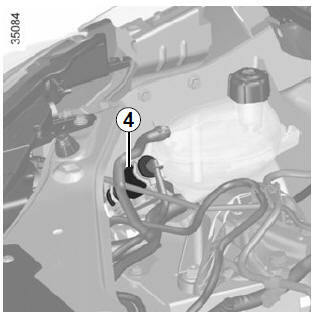 In addition, the engine cooling fan may come on at any moment.